FMCBC July e-news: Opposition to heli-biking application, Manning Park Donut Hole, Member Club Grant update, and more! At the end of May, Blackcomb Helicopters Ltd. applied for a commercial heli-biking tenure in hopes of creating six new trails in the Tenquille-Owl Lakes Recreation Area. The public comment period is now closed, but you can still view the application here. The FMCBC is opposed to the proposal—a sentiment that is clearly shared by the public, as over 2000 people have signed the online petition against heli-biking in this beautiful and sensitive valley. You can read more details in the letter written by Jay MacArthur, an FMCBC Director and executive member of the ACC-Vancouver Section. Also, be sure to check out this Letter to the Editor from Dave Harkley (Trails Coordinator, Pemberton Wildlife Association) regarding the application (it’s the third letter on the page). There will be a Celebration of Life later this summer. Thanks for the thanks, Ramblers, and we wish you all the best with your course! The Manning Park “Donut Hole” is a piece of Crown Land surrounded by Skagit and Manning Provincial Parks. Unlike its neighbours, this pocket of land, comprised of Smitheram Valley, Silverdaisy Valley and 26 Mile Valley, lacks provincial park protection. The Wilderness Committee has been closely following developments in the region. Earlier this month, they discovered BC Timber Sales (BCTS) logging road construction in the area. And just last week, a Wilderness Committee expedition discovered new clearcut logging. That’s why your help is needed to protect this forest from clearcuts. Click here to learn more about the Donut Hole and what you can do to help. 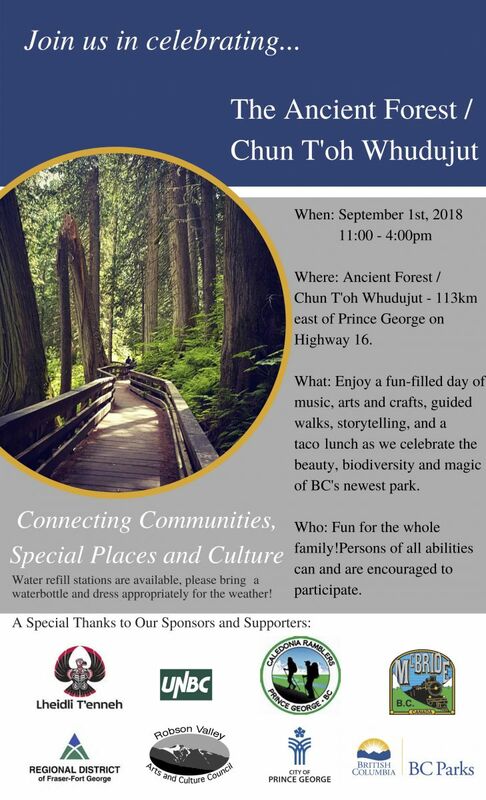 On September 1st, you're invited to the Ancient Forest/Chun T’oh Whudujut Park celebration day! Enjoy a fun-filled day of music, arts and crafts, guided walks, storytelling, and a taco lunch in celebration of the beauty, biodiversity, and magic of BC's newest park. The event runs from 11 am - 4 pm at Ancient Forest/Chun T’oh Whudujut Park (113 km east of Prince George on Highway 16). It's family friendly, and persons of all abilities can and are encouraged to partipate. To learn more, click on the poster to view it in full size. Over the past year, the Whistler Museum and Archives Society, with the support of Virtual Museum of Canada, has been working on the release of a new online exhibit entitled Coast Mountain Gothic: A History of the Coast Mountain Gothic Arch Huts. Gothic Arch Huts are modest yet iconic structures that played a major role in the exploration of the Coast Mountains of British Columbia over the past 50 years. Discover the stories behind the design and construction of these shelters and meet the people and organizations that brought them to life. Along the way, you'll learn how networks of hiking trails help protect the sensitive alpine environments and support outdoor educational activities. The online exhibit is now live and available in both official languages on the Virtual Museum of Canada's website. Rocky Mountain Books just released their new titles for Fall 2018. You can view the full list here. Did you know that the Central Okanagan Climbing Association has custom t-shirts for sale? All proceeds go to supporting route development and maintenance in their area. Look good, feel good, and support a good cause! The Nlháxten/Cerise Creek Conservancy Draft Management Plan is now available for review. The public comment period is open until August 15, 2018. Learn more. Don’t miss the Vancouver International Bird Festival, which will be taking place from August 19–26 at various locations around the city. Look forward to many exciting events, speakers and activities for all ages, including bird tours, films, art shows, art workshops,, and lectures by leading ornithologists. During the week of July 23, 2018, the BC Forest Practices Board examined harvesting, roads, silviculture, fire protection and associated planning carried out by Western Forest Products Inc. on tree farm licence 39 (Campbell River Natural Resource District). A report will be prepared when the audit is complete. Learn more. Does your family need to unplug and get outside? Or find new ways to connect with the outdoors, and not screens? Check out Healthy By Nature, a BC Parks Foundation Initiative. Help shape the future of Grouse Mountain Regional Park! There's now a management plan framework in place that incorporates the public and stakeholder feedback provided last fall, and the Grouse Mountain Regional Park Planning Team wants your feedback on what's proposed. Check out the plan and fill out the online survey by August 10th. Thanks to Anatoliy Vlasov of the ACC - Vancouver Section for this month’s feature photo, which showcases the view of the Panorama Ridge, Mt. Garibaldi, Mt. Price, and Garibaldi Lake from the Black Tusk Trail. "Me and Fain McGough III, whom I met through the ACC's Facebook page, decided to scramble up the false summit of the Black Tusk in Garibaldi Provincial Park, British Columbia. Without a doubt, it was one of the most beautiful scrambles/hikes I have ever done. Most of the trail was snow free, but there was enough snow close to the Black Tusk itself to provide ample photo opportunities. Going up the chimney was an extra bonus. We later found out that there is an alternative route to the mountain, which would have taken 2 hours instead of 6. Two roads diverged in a wood, and I, I took the one less traveled by. And ... now my legs hurt."